As Notre Dame de Paris is in flames this evening it is not possible to say what treasures within have survived the blaze. It is known at this stage that firefighters managed to evacuate some pieces. 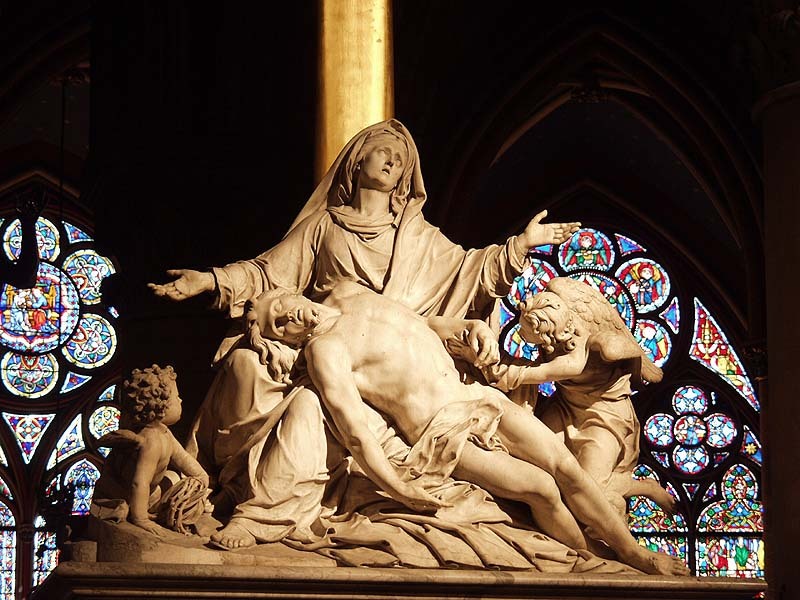 The Rose Window and other stained glass treasures seem to have survived and the fate of the Pieta, or The Descent from the Cross by Nicolas Coustou, in the choir of the cathedral, is unknown but that part of the floor seems to be intact. The building is an icon of global gothic architecture. The 12th century gothic spire collapsed but the two towers survived. President Macron has vowed that it will be rebuilt. This entry was posted on Monday, April 15th, 2019 at 8:48 pm	and is filed under ART. You can follow any responses to this entry through the RSS 2.0 feed. You can leave a response, or trackback from your own site.